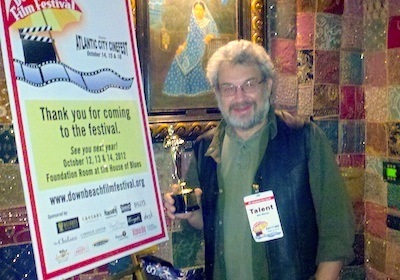 Best Documentary, Atlantic City Cinefest! Greetings from Atlantic City — OK, not literally as I’m back home, but I was in fact there this past weekend of October 14-16 for the 4th annual Atlantic City Cinefest, presented by the Downbeach Film Festival. Not your normal type of film festival location, but that made it all the more fun and definitely unique. The fest is run a by a dedicated group of film lovers headed by William Sokolic and they work very hard to create a festival that feels at once real and fantastical, given the Las Vegas inspired nature of modern Atlantic City (and there’s still a beautiful beach, boardwalk, ocean, and salt water taffy). But I’m delighted to report that the highlight of the weekend for me was that “Deconstructing Dad” won the Best Documentary award! A real thrill and thanks to Bill Sokolic, Joelle Sokolic, Ned Eckhardt, and everyone on the festival staff for the award and a great time in Atlantic City. And thanks as well to George Stewart who originally suggested that I submit my film to the festival…. Caroline Devine, the local sound artist who is currently exhibiting at the gallery came across the film and thought it would be a good idea for the gallery to show it as part of their ongoing festival/series Friday Night Films, and it has come to pass. Here’s a link to the event — which is scheduled for Friday August 12th, prices are £5 (concessions £3). This is another one I’d love to attend, Milton Keynes is clearly one of those cool UK places, but it’s just not possible at present. But for those of you in the London environs (and Oxford, Cambridge, and Stratford), hope you can make it! Thanks to Caroline and Ursula White of Independent Cinema MK for putting this event together…. And more announcements about the film coming up shortly!